This 2016 Lowe Roughneck 1650 is in like new condition with a number of factory and owner upgrades. The boat and engine are still under manufacturers warranty. The engine was recently inspected by a Tohatsu dealer and the oil and filter replaced. Stock #145594 Like new Roughneck 1650 DT! Barely used! Minn Kota Riptide 55 lb trolling motor with remote! Lowrance Hook 7! Custom gun box, fishing holsters & LEDs! 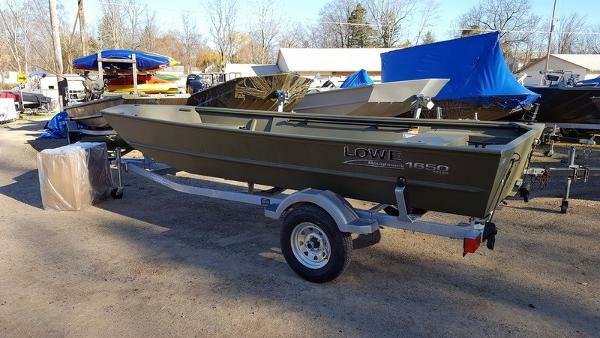 If you are in the market for a flats boat, look no further than this 2016 Lowe Roughneck 1650 DT, just reduced to $11,500 (offers encouraged). 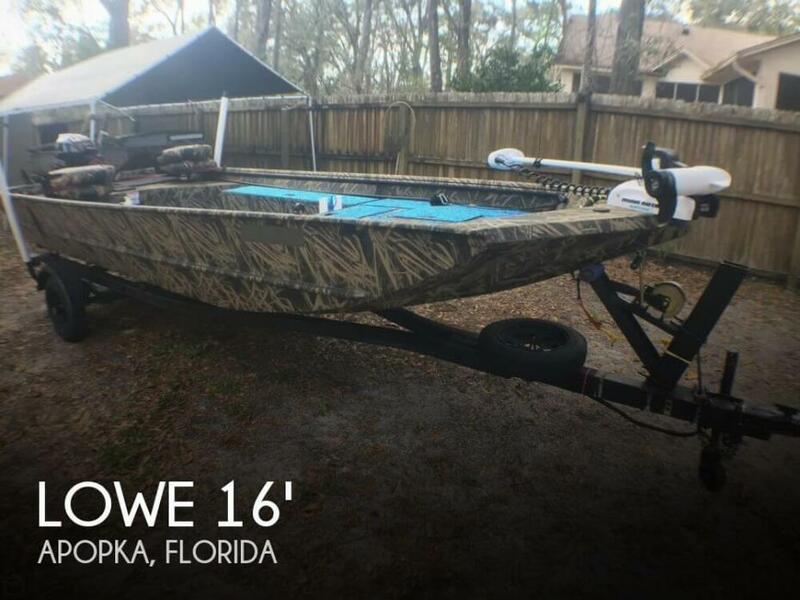 This boat is located in Apopka, Florida and is in great condition. She is also equipped with a Tohatsu engine that has only 50 hours. Reason for selling is purchased another boat. 2017 Lowe Roughneck 1650SC Put yourself in command with the tough and sturdy Roughneck 1650 SC, featuring a convenient side helm console with remote outboard steering. Built to commercial-grade standards, the Roughneck 1650 SC bests typical jons with plenty of prowess for hunting, fishing, work applications and more. 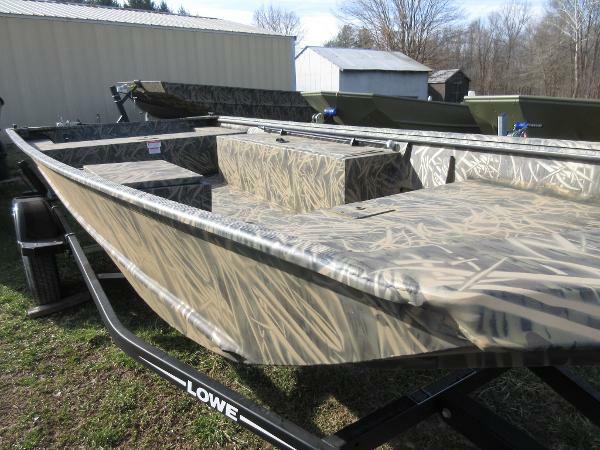 Maximum strength and durability are ensured with Lowe Boats top-quality all-welded, all-aluminum construction. You can count on this jon boat to deliver you to the action! Please note: This boat model may or may not be in-stock. A Nationally Advertised Price, if listed, may change without notice or include accessories not fully described herein. Please contact your local, authorized dealer for exact details on model availability and package pricing. 2017 Lowe Roughneck 1650 For reliability through and through, the all-aluminum Roughneck 1650 delivers premium access to your prey with a no-nonsense build capable of both stalking and chasing speeds. 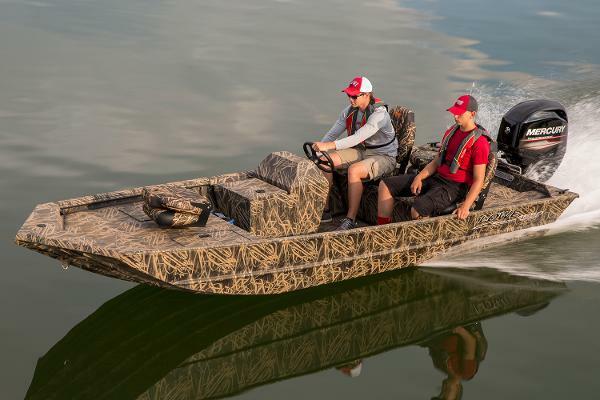 With the dependability of commercial-grade standards, the Roughneck 1650 has the edge over other manufacturers jons for duck hunting, fishing, work applications and more. Lowe Boats award-winning customer service combined with a limited lifetime warranty mean you can rely on your Roughneck jon for many years. Please note: This boat model may or may not be in-stock. A Nationally Advertised Price, if listed, may change without notice or include accessories not fully described herein. Please contact your local, authorized dealer for exact details on model availability and package pricing. 2014 Lowe Roughneck 1650SC Lowe Roughneck 1650SC with 20 EL Fourstroke and trailer. This boat model may or may not be in-stock. Please contact your local, authorized dealer for more information Put yourself in command with the tough and sturdy Roughneck 1650 SC, featuring a convenient side helm console with remote outboard steering. A model constructed to deliver lasting performance and easy handling, the Roughneck provides all the control you need to explore and reap nature’s rewards. Built to commercial-grade standards, the Roughneck 1650 SC bests typical jons with plenty of prowess for hunting, fishing, work applications and more. Maximum strength and durability are ensured with top-quality Lowe all-welded, all-aluminum construction, featuring closely spaced cross-rib substructures and solid extruded center keel. Count on the Roughneck 1650 SC to deliver you to the action.Side helm console with remote outboard steering2 seats (driver & passenger)Pin-type pedestal seat base in the bow and aft deckBow aerated livewell (16 gal. )Two bow deck storage compartmentsExtruded aluminum accessory receiver gunnelTrolling motor harnessNavigation lightsBilge pumpCleats (4)Side gunnel rod organizer w/ 3 rod holdersDead grass green paint standardOptional hand-applied camo paint available in 4 color patterns: Mossy Oak® Shadow Grass, Mossy Oak Break-Up, Reelfoot® River Bottom, or Reelfoot Grassland Notable options include: your choice of Mercury® outboard; custom-fit Lowe bunk trailer selection; MotorGuide® trolling motor; super-tough Rough Liner™ sprayed-in floor liner; and a 6.6-gallon portable fuel tank. 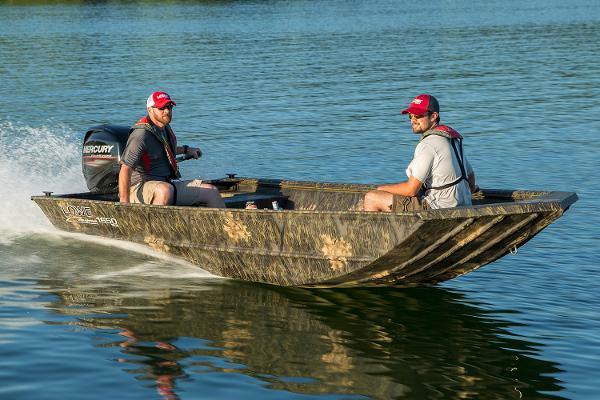 Lowe boats are available with various horsepower Mercury tiller and remote control outboards. Standard equipment and options may vary from model to model. 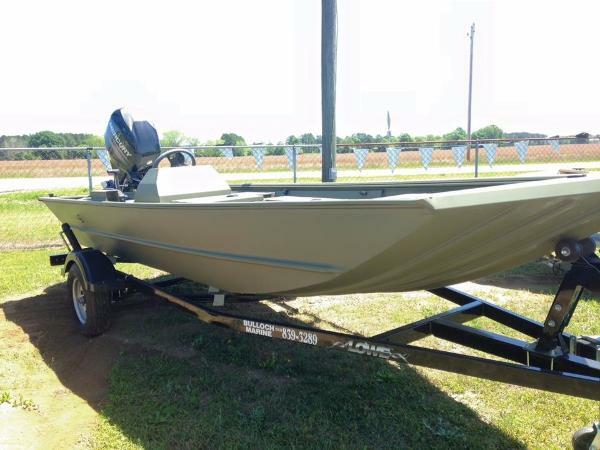 2017 Lowe Roughneck 1650 Price includes a 2017 Karavan trailer with swing tongue, factory installed livewell, rod/gun box, Fish package ( Camo fishing Seat, Nav lights, trolling motor wiring harness and bilge pump) welded on transducer bracket side panels, 20" transom. Price includes dealer prep and freight and all factory rebates. Color is Mossy Oak Shadow Grass. 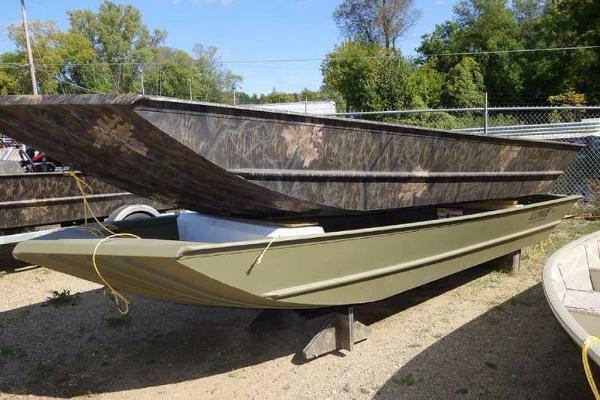 Sale price $6,299.00 Package prices Include Boat, Motor and Trailer. Price with a Mercury 9.9ML 4-stroke, rope start and Karavan trailer $8,399.00 Price with a Mercury 25ELHEFI and battery $10,499.00 Price with a Mercury 25ELHPTEFI and battery $10,899.00 Price with a Mercury 40ELHPTEFI and battery $12,299.00 LWC05885B717 WR4965 For reliability through and through, the all-aluminum Roughneck 1650 delivers premium access to your prey with a no-nonsense build capable of both stalking and chasing speeds. 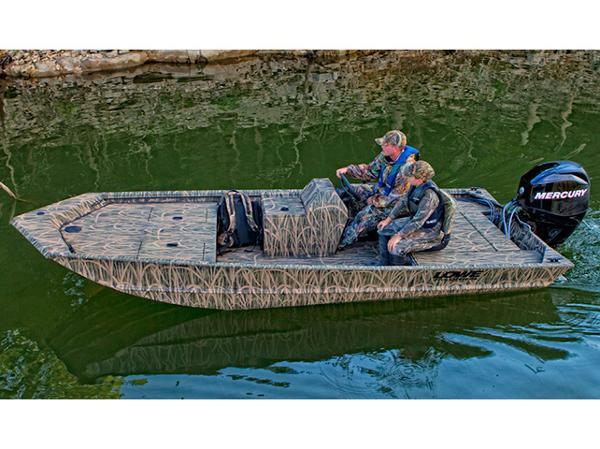 With the dependability of commercial-grade standards, the Roughneck 1650 has the edge over other manufacturers jons for duck hunting, fishing, work applications and more. Lowe Boats award-winning customer service combined with a limited lifetime warranty mean you can rely on your Roughneck jon for many years. 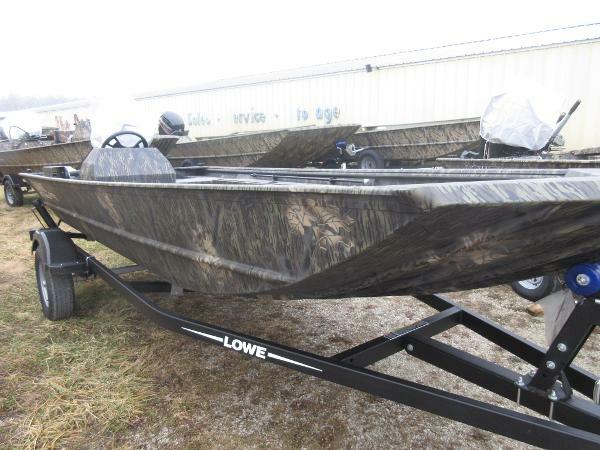 2015 Lowe Roughneck 1650SC This boat model may or may not be in-stock. Please contact your local, authorized dealer for more information Put yourself in command with the tough and sturdy Roughneck 1650 SC, featuring a convenient side helm console with remote outboard steering. A model constructed to deliver lasting performance and easy handling, the Roughneck provides all the control you need to explore and reap natures rewards. Built to commercial-grade standards, the Roughneck 1650 SC bests typical jons with plenty of prowess for hunting, fishing, work applications and more. Maximum strength and durability are ensured with top-quality Lowe all-welded, all-aluminum construction, featuring closely spaced cross-rib substructures and solid extruded center keel. 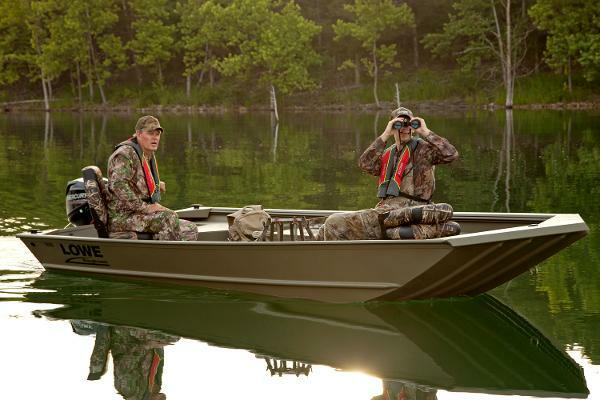 Count on the Roughneck 1650 SC to deliver you to the action. 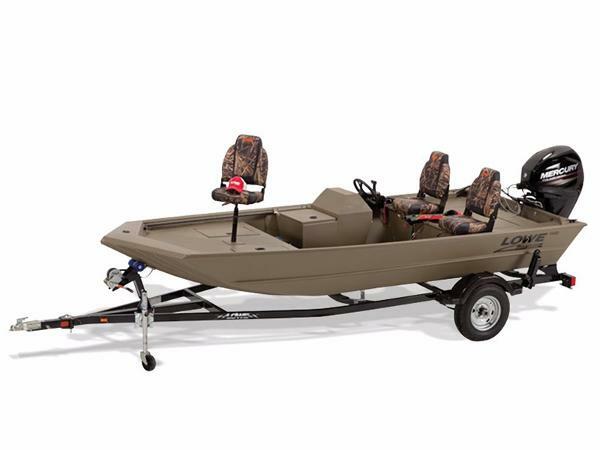 Side helm console with remote outboard steering 2 seats (driver & passenger) Pin-type pedestal seat base in the bow and aft deck Bow aerated livewell (16 gal.) Two bow deck storage compartments Extruded aluminum accessory receiver gunnel Trolling motor harness Navigation lights Bilge pump Cleats (4) Side gunnel rod organizer w/ 3 rod holders Dead grass green paint standard Optional hand-applied camo paint available in 4 color patterns: Mossy Oak® Shadow Grass, Mossy Oak Break-Up, Reelfoot® River Bottom, or Reelfoot Grassland Notable options include: your choice of Mercury® outboard; custom-fit Lowe bunk trailer selection; MotorGuide® trolling motor; super-tough Rough Liner sprayed-in floor liner; and a 6.6-gallon portable fuel tank. Lowe boats are available with various horsepower Mercury tiller and remote control outboards. Standard equipment and options may vary from model to model.